As seen in our survey results, scoop gaps along string paths and the cross profile radius were regarded as highest priority. The model I am using to study their interaction is a grid of 3×3 points. Think of it as 3 smaller radii crosswise (usually around 42mm), and 3 giant arcs lengthwise (representing scoop gaps under G, E, and down the centerline). Here, I’ll define 4 of the radii completely, and show the relationship between the remaining two. All solutions along the graphed lines are geometrically compatible with the constraining dimensions specified in the subtitles (which are based on median survey results). Option 1 (one radius all the way) from our survey is the only one where all crosswise radii are defined. But one of the three scoop gaps can’t be set to our target without changing the middle radius. In this case, with G scoop set to 0.75mm and E set to 0.25mm, the center-line gap comes out to 0.68mm, or 36% over our target of 0.50mm. If we instead prioritize our scoop gaps, setting them to 0.75mm, 0.50mm, and 0.25mm, we can calculate the middle radius out to 38mm, which matches our survey’s Option 3 (tighter radius in the middle). I’ve made fingerboards for respected [players] that prefer an even radius along the whole board, but there will wind up being more scoop on the center strings, which makes the string heights higher than the g string in the middle of the board. Note that our target scoop gaps decrease linearly from G to E. Some makers intentionally skew the gradation of scoop gaps, reasoning that players may not perceive the larger gap due to similar tensions and diameters of the G and D strings. It is difficult to draw conclusions about scoop gap skewing trends from the survey, because responses were given to the nearest 0.25mm. Below are a few other gap size permutations from our survey. Note that in every case with nut & bridge radii set to 42mm, for the centerline scoop size to be halfway between G and E, the middle radius always comes out 38mm. As the middle radius flattens from 38mm, the centerline gap skews toward G. The tighter the radius (<38mm), the more it skews toward E.
Those who selected Option 4 (tighter radius at the nut) describe it as a section of a cone, with radius changing proportionally to the width of the fingerboard. Option 2 (flatter radius at the nut) respondents did not give specific numbers about how much flatter. It turns out that gradually increasing the radius toward the nut as I had described in the survey does not produce a plausible solution for our given gap sizes. In general, for a flatter nut radius, the middle radius will still tighten relative to the bridge end. I will tell you how to go all Traité de Luthérie so you can resolve your own favorite dimensions! Or if you’re too lazy, I’ll give you an Onshape CAD file to play with. Here are the results of the survey, with 67 responses collected between 12/19 – 12/25. Participants were asked pick answers that best described their mental model of a typical violin fingerboard. If their concept of fingerboard dimensions were not well-described by the given answers, they were asked to pick the closest answer and elaborate about discrepancies in the comments section. Essentially an adjustment to the position relative to the centerline in combination with an adjustment to its height of said radius along the length gives the resultant change in width and edge heights. Roundness at the bridge end keeps the middle strings from being in a hole in the upper positions (the string doesn’t need to be depressed as far) making double stopping and bowing easier. Flatter at the nut means the left hand doesn’t have to climb over the strings and chords are easier to play cleanly. I am limiting this analysis to arcs, but some participants noted that their cross-sectional profiles were not arcs (parabolic, “egg-shaped,” etc). Many players commented that string scoop was dependent upon various factors: string heights, string diameter and properties, player preference & style of playing, etc. The treble and bass scoop gaps were symmetrical for the majority of responses. … reaching over the strings comes from the treble side of the board so I put a little more scoop on this side to facilitate this action. 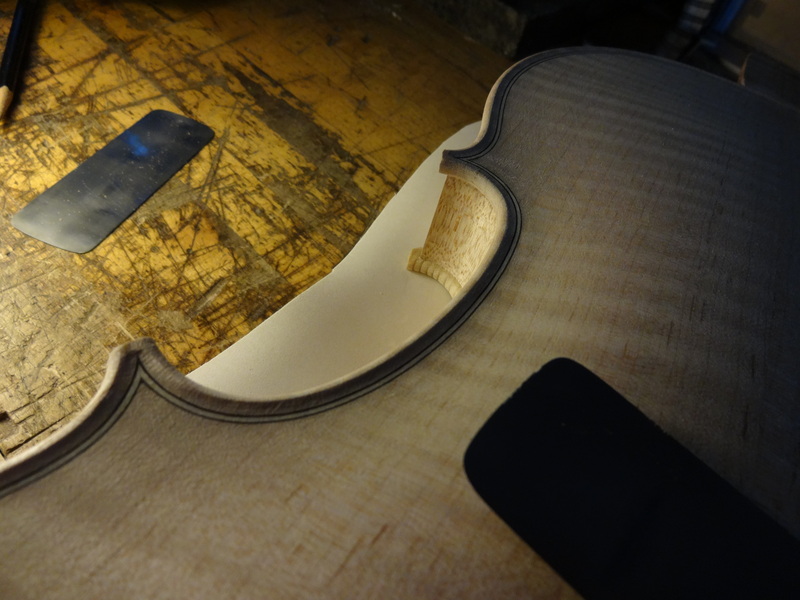 I make the edge thickness the same instead of measuring side scoop. Those who use edge scoop to achieve uniform edge thickness would need a deeper edge scoop for deeper string scoops, explaining why most asymmetrical responses have heavier gaps on the bass side. Lifting the floor of the bridge end of the fingerboard is another method for achieving a more uniform edge thickness. I try to get a consistent radius curve throughout the scooping. That means that, for me, scoop centering is irrelevant. I did not receive comments about scoop centering from participants who bias the depth toward the bridge. Many participants cited player style and player preference as the main determining factors for the dimensions used. The overall highest ranked factors are string scoop size and radius fidelity. The geometric interactions between scoop gap and the radius at nut, middle, and end will be discussed in greater depth in my next post. Thanks to everyone involved in this survey. 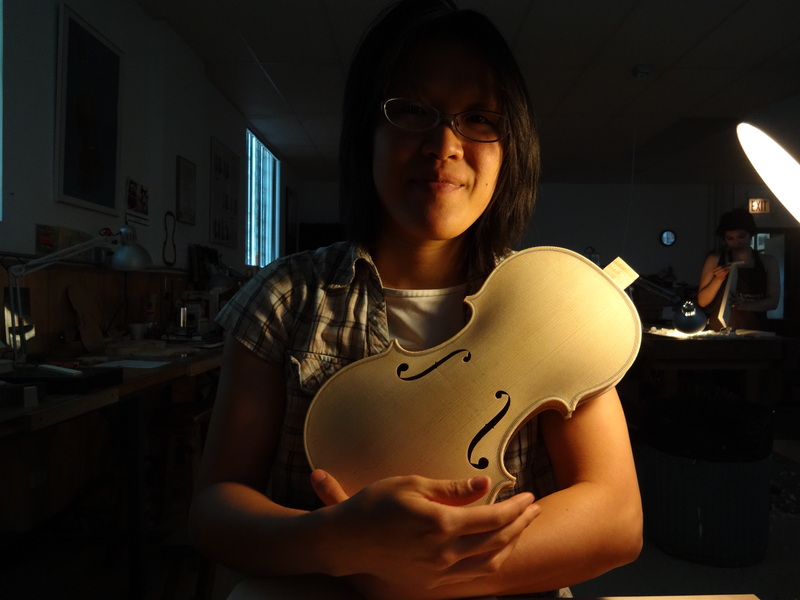 Stradivari & sons take a little trip to the 21st century…..
Claudia Fritz is one of the designers of the Paris experiment, the double-blind test of preference of old Italian violins and newly made violins. Its results made a few people angry, with implications such as newly made instruments sound just as good as Strads, and professional violinists can’t tell the difference by playing in a room or concert hall. Either way the results went, people were gonna get angry. Huh, so a “high B” is closer to a C in music, but closer to an A in grades.